Artist Billie Eilish has achieved a new streaming milestone on Apple Music, breaking the service's all-time record for users "pre-adding" an album to their libraries ahead of its release. According to Apple, Eilish's upcoming album "When We All Fall Asleep, Where Do We Go?" has earned more than 800,000 pre-adds on Apple Music ahead of the album's launch on March 29 (via Music Business Worldwide). By pre-adding an album, subscribers can save it in their Apple Music libraries and listen to any songs that may already be out for it. Then, when the full album is released Apple adds the entire album to their account. Although this process can be unreliable on Apple Music, and sometimes the full album isn't added at the time of its release, Apple Music executive Oliver Schusser sees pre-adds as a sort of modern pre-order feature for the streaming era. 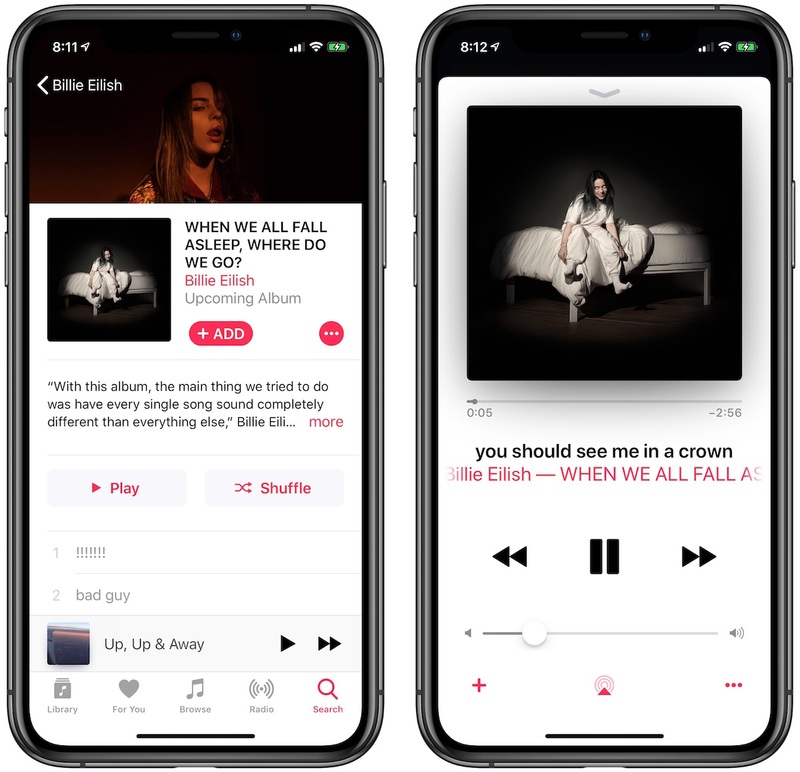 Schusser said that, "While most services focus the majority of their efforts around playlists, Apple Music still emphasizes albums because we understand their value as a storytelling tool for artists to create context around their music." Apple has been a longtime supporter of Eilish, first featuring her as the Up Next artist for September 2017, showcasing her in interviews with Beats 1 Radio hosts, exclusively premiering some of her songs and videos, and partnering with her to host her own Beats 1 show. Apple also worked with Eilish on its holiday commercial "Share Your Gifts" last year, where her single "Come Out and Play" was featured. Eilish's team also commented on the pre-add numbers, with Interscope vice chairman Steve Berman stating, "These pre-add numbers are incredibly exciting for Billie, and a real validation of everything we – the artist, Darkroom, Apple and Interscope – have worked together on over the last three years. Internally, hearing these [Apple pre-add] results, it makes us all incredibly proud – and it makes us want to work that much harder, because we can see exactly what the opportunity is." According to Schusser, the criticism that streaming music services have taken the personality out of artists is incorrect, and he points toward Eilish as the prime example: "Apple has always given creators platforms to connect with audiences around the world and the space and freedom to be creative. It goes to the core of who we are as a company." It happened. I am officially old. Who is she? A YouTuber? yeah, be nice if the pre-add process worked and didnt still show as unavailable after the album had been released. The last real music was Black Sabbath, man. AC/DC. Humble Pie. Cream. ZZ Top. Deep Purple. The stuff in the last 35 years has been trash. Are you the creepy old guy who lives in the basement apartment below me? Billie Eilish is crazy talented. She deserves it. Unlike other “artists”. I love Sabbath, AC/DC, Humble Pie, Cream, ZZ Top, Deep Purple (both Gillian and Coverdale/Hughes), and I also love Billie Eilish. Who?! Never heard of her. Man, I must be getting old. . . Which would be serious money back in the pre-order album days rather than today's $0.00001 per stream. I haven't heard much of her, but I really like "you should see me in a crown". It's got this raw, dark energy to it. Give Bellyache, Ocean Eyes, When The Party‘s Over (video is great! ), Bored and Lovely a listen as well. Those are my favorites but I actually like most of her songs. Well... given that she is born AFTER 9/11... and is already in the B.
I'd say... yes... we ARE old.